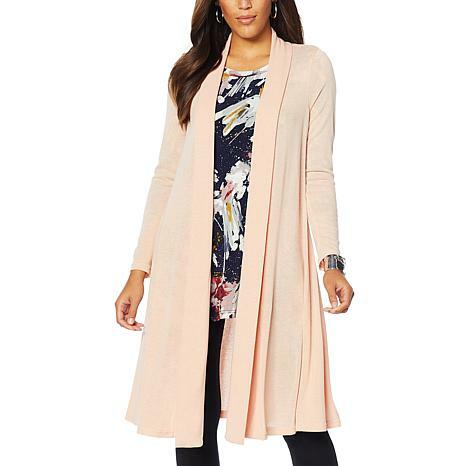 Not all cardigans are created equal, this duster gives you a seamless look when you top off your ensembles. The added fabric make it an easy item to wear indoors and outdoors and to pack along with you on your travels. 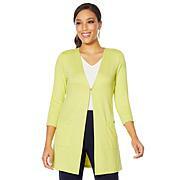 Beautiful sweater material, so comfortable and chic. I've gotten so many compliments on this beautiful duster. I'm going to get another color too. I am 52 & 110lbs purchased black in xs. The sleeves are verrrry tight & a lot fuller than I would like. However, it is very classy. No star deduction!! Quality item. Flows beautifully. Thank you. Runs true to size. 5'4" and weigh 120. Initially purchased the XS but exchanged for the S. Perfect. Perfect cut, weight and fit. FINALLY! Long enough, fits in shoulders , generous cut but not baggy! Most dusters gap way away from the bust and emphasize abdomen. More of these, please! I paired this with the Marlawynn ribbed tank. Grey slacks and grey pumps. I received many compliments on this piece. Very comfortable.